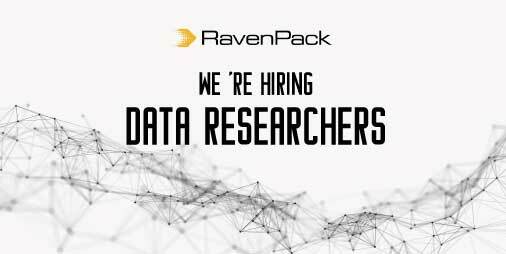 We are looking for a Data Researcher to join RavenPack’s Product Team. As a researcher, you will be in charge of modelling information from the media using internally developed tools. Tasks involve understanding entities such as Companies, Products and People, and creating profiles for these using RavenPack’s tools such that our natural language processing software can detect references to them in text content. In addition to this, you will help train our system to detect events in which these entities are mentioned, and the role in which the entity appears. Training will be provided and you will work directly with senior members of the research team. You will be reporting directly to the Head of the department and will interact with other team members as well as other departments such as Data Science and Sales & Marketing. The location of this position is in Marbella. The ability to communicate effectively in English both in writing and verbally is a requirement. Knowledge of Spanish is not a business requirement. European Union legal working status is required. Competitive compensation and a fun working environment. As a Data Researcher, you will be contributing to the growth of our Natural Language Processing technology, creating and maintaining the taxonomy that helps us categorise the way in which humans understand the world such that machines can make better decisions. You will be researching and identifying entities (such as people, companies, currency,...) and events (actions related to these entities and that can have an impact) from different content sources. Processing data in an accurate manner using technical knowledge. Being responsible for the quality of the data, its accuracy and completeness. During your first weeks at work: You will be trained by the members of our Research team. At the end of the training, you will be able to perform your tasks meeting our standard of quality, although you will be always supported by the team. Ability to speak and write in English fluently and idiomatically (native English-language level or advance knowledge on it). University education and European Union legal working status are required. Good knowledge of linguistic: knowing how the language works. Independent worker with the ability to effectively operate with flexibility in a fast-paced environment. Team player with exceptional interpersonal skills and solution-oriented attitude. Familiarity with web searching skills and the ability to source information. Ability to work to a short time schedule (given by hours) and on several projects simultaneously. Knowledge of web and social media applications. Must be able to use Microsoft Office and Google Documents. Drive for excellence, attention to detail. University background in Linguistic, Translating and Interpreting, Language Teaching, Philology, Natural Language Processing or related fields or equivalent practical experience. High and demonstrated knowledge with research methodologies.